Rich and luxurious, the 100% Pure Restorative Sea Culture Extra Riche Créme deeply drenches skin with nutrient-rich moisture. In a base of antioxidant-rich Sea Buckthorn Water, which contains a potent amount of Vitamins C, E and A as well as Omegas 3, 6, 7 and 9, this nourishing facial cream also contains soothing Shea Butter, Jojoba Oil, Coconut Oil and Brazilian Bacurri Butter. 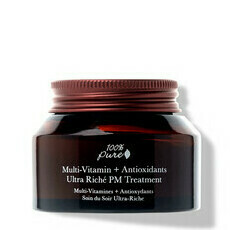 Designed to help soften and replenish skin with brightening and revitalising vitamins, minerals and antioxidants, this quenching cream also contains skin-plumping Seaweed and Red Algae to lock in hydration, retain suppleness and support elasticity, while soothing Golden Chamomile, Lavender and Honeysuckle calm and protect. 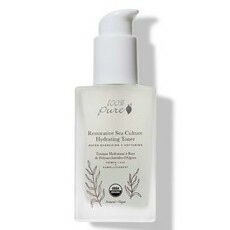 Use in conjunction with the 100% Pure Restorative Sea Culture Hydrating Toner for best results. 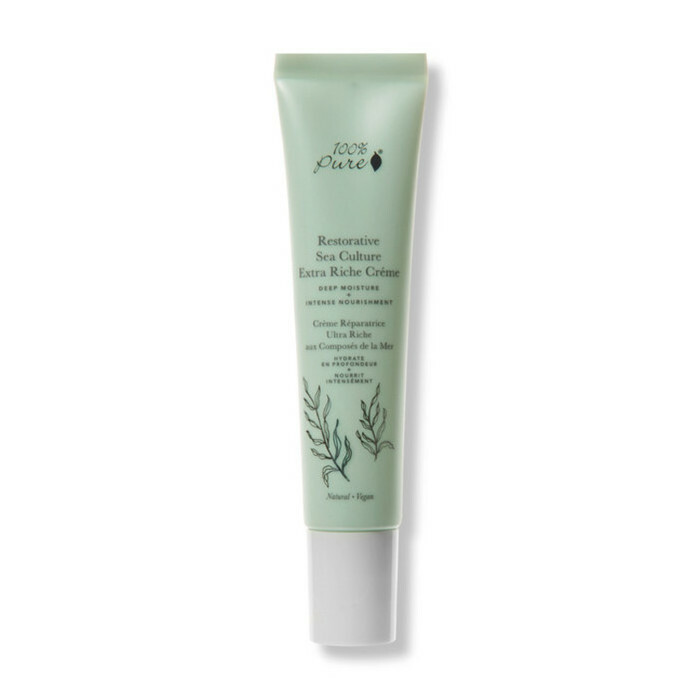 This Restorative Sea Culture line replaces the discontinued and much-loved 100% Pure Jasmine Green Tea collection. Made in California. Vegan. Certified Cruelty-free. Chamomile, Coconut Oil, Jojoba Oil, Sea Buckthorn, Shea Butter, Sunflower Oil. Organic Hippophae Rhamnoides (Sea Buckthorn) Water, Organic Glycerin, Organic Butyrospermum Parkii (Shea Butter), Organic Platonia Insignis (Bacurri) Seed Butter, Organic Cocos Nucifera (Coconut) Oil, Organic Simmondsia Chinensis (Jojoba) Seed Oil, Cetearyl Olivate, Sorbitan Olivate, Cassia Angustifolia (Senna) Seed Polysaccharide, Chrysanthellum Indicum (Golden Chamomile) Extract, Alteromonas (Deep Sea Algae) Ferment Extract, Jojoba Esters, Helianthus Annuus (Sunflower) Seed Wax, Acacia Decurrens (Green Wattle) Flower Wax, Polyglycerin-3, Beta-Glucan, Algin, Organic Lonicera Japonica (Honeysuckle) Extract, Xanthan Gum, Organic Essential Oil Blend: Citrus Aurantium Bergamia (Bergamot) Fruit Oil, Cedrus Atlantica (Cedarwood) Bark Oil, Vetivera Zizanoides (Vetiver) Root Oil, Citrus Sinensis (Blood Orange) Oil, Salvia Officinalis (Sage) Oil, Lavandula Angustifola (Lavender) Oil. After cleansing and applying serum, apply a small amount to the face and neck, gently massaging and pressing into skin, taking care not to pull or tug. Can be used morning and night. My new favourite moisturiser. I would describe my skin as dry / mature and I have struggled to find a moisturiser that will keep my skin hydrated until this! Leaves a very odd feeling after applied. 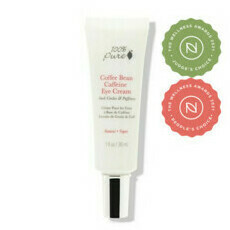 Leaves my skin feeling congested and clogged, did nothing for my complexion.